The date – 4th Nov 2012 was a landmark day in the evolution of many of us, students and faculty, at the University College of Medical Sciences (UCMS), Delhi. Our institution has long taken pride in its research output. I recall the time when I would trawl Index Medicus in the search for literature without really having an inkling of how things worked. Sometimes they did, sometimes they did not. I would assume that if, with what I now recognize as my ham-handed ways, I could not find published work in my area of interest it did not exist. I could merrily claim a first with my work! Things changed with the advent of computers and electronic searches of the literature. Before computers became ubiquitous at UCMS, the job of literature search was entrusted to a select few who would zealously guard their machines. I had to fill in an elaborate printed form with, among other things, key words that were supposed to facilitate my search. I did not know how or why search terms worked; nor, for that matter, I suspect, did the data operator manning the computer – the person entrusted with my job; however, my joy would know no bounds when I was presented with a pile of sheets, folded accordion-like, of output printed with a dot-matrix printer whose ribbon had long gone too dry to produce clear text. Triumphantly, I would carry the sheaf of paper back to my room and read the titles, abstracts, and other details with my myopic eyes to glean information obtained from these magic machines. Most of what I read would not even be remotely relevant to my needs. I would be happy if I could find one or two references that I could use in my work. Fast-track to a computer on my desk with a working internet connection. Suddenly, I could do my own searches. I soon realized that now I also had no one to blame when my searches did not work and brought back only junk. The pointing finger would turn around and point straight back at me! 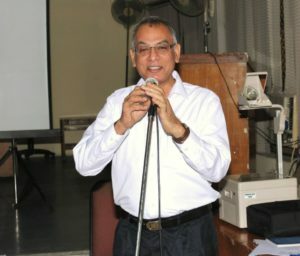 A chance encounter with Vasu Ma’am at a medical students’ workshop in Kolkata, and the tireless efforts of my colleague Dr. Satendra Singh, resulted in the happy event of UCMS hosting a workshop for students and faculty on 4 November, 2012. I entered an ignoramous; exited goggle eyed! So there is method to this madness, I told myself. The hallmark of the real expert is that she makes something so complicated seem so simple – and Vasu ma’am fits that bill. Having dazzled us with tantalizing treasures, she wisely offered to support our future endeavors in improving our lot. Surely, when we tried out what we had learned at her workshop it was clear that we had a long way to go before we could imagine that we had conquered the monster. Being a teacher myself I understand the dictum that “the best way to learn is to teach”. This fit perfectly with our need to train new post-graduates to grapple with research, including literature searches and the use of referencing software. By incorporating our learning from the QMed workshop into our own workshop-based training schedule for post-graduate students of all disciplines at UCMS we hoped to replicate the good deed done to us by QMed. Every year our thesis writing workshops train 140 students in research. In addition our UG students have set up a rolling system to train their juniors in the craft of literature search and referencing software when they consider applying for summer research projects for the Indian Council of Medical Research (ICMR). Documented feedback from our participants affirms that the QMed inspired hands-on sessions on searching the literature, and using Mendeley, the referencing software, are the most popular and highly appreciated. QMed’s popularity in the UCMS eco-system was evident again when our undergraduate students organized Medicon, a conference for and by UG students interested in research in April 2013. One automatic, hands-down choice, was a literature search session by QMed. 4 Nov 2012 was indeed a landmark day for us at UCMS. Thanks to QMed, we changed for the better. You can too. Just ask QMed!